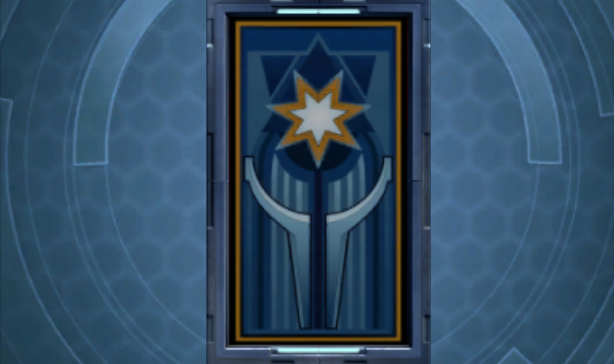 Guild Heraldry is now available on PTS (once we come back online)! Take a look through the system and please let us know your thoughts in this thread. As always, if you have bugs to report please head over to the PTS bug report forum. Thanks everyone. The only one I thought really use was the Imperial symbol but then the heraldry is displayed on the guild info panel directly below the large Imperial faction symbol That also limits the color choice to tie in with the faction symbol colors or to look like a big clash. How did whoever designed that not realise how much OCD they would trigger with how the bottom of the heraldry does not line up with the bottom of the panel guild info panel! If you have recruitment off then the heraldry hangs off the bottom and if you have recruitment enabled so the panel is taller then there is a big gap. Would definitely suggest stretching the panel to line up with the bottom and vertically centering the logo when that happens. Honestly, it looks very "bolted on" which is a shame as it's clear a lot of work went into it. Can you add an option to turn it off? I don't want my guild to be forced to use it in it's current form. I doubt I'm the only one that wishes you spent the time fixing the problems with the guild interface. 7 years and we still can't right click /w guild members with accented letters, custom chat channel permissions broken for over 5 years, conquest leaders lists not working since being implemented, conquest leader lists only showing "by character" instead of "by legacy", roster row group select bug still present since the new panel was added, guild log sorting dates alphabetically, having no "Remove from guild" confirmation, can't group set member notes as you can rank, horrible text resizing and saving mechanism for new guild details text boxes, guild ships and strongholds still vanishing etc etc etc. These are things that actually affect guild management. If those are the only ones we have to chose from, I am really not a fan and paying the cost for it we will not do it. Paying 1m (at least that what the price seem to be in the video) for symbols that we will particularly not like would be stupid. Thanks for the link as I am not wasting my time to go on PTS for this. Pretty much this. Heraldry needs a lot more work before it really adds anything to guilds. At the moment it looks like a 3rd party add-on and please, please fix some of these most pressing bugs. Here's just a quick look. I'll check it out in more detail later this weekend. There are far too few symbols... of both kinds. Which brings me to my next issue. Background graphics and central icons are both called "symbols" in the menus. This is confusing. Variety of weapons -- sabers, saberstaff, pikes, blasters, cannons, bowcasters, artillery, thermal detonator, flamethrower, blades, etc. Class ships, famous ships, and ship silhouettes. Fierce Star Wars creatures -- Rancor, sarlacc, acklay, nexu, gundark, kell dragon, wampa, krayt dragon, akk dog, terentatek, etc. Variety of helmets -- Mandalorian, dark honor guard, bounty hunter hat, smuggler hat, Knight of Zakuul, Sith/Jedi hood, reveler's hat, etc. Racial heads -- droids, all playable races, devaronian, gand, talz, kubaz, trandoshan, gamorrean, etc. Roleplay symbols -- drama mask, book, dice or d12, holocom, holodancer. Combat symbols -- creature skulls, claw marks, crossed weapons, fist, cyborg fist, rocket pack. Atronomical symbols -- sun, moon, star, comet, spiral, black hole. Crafting symbols -- tools, crossed hammer and wrench, gonk, GTN kiosk, sandcrawler. Star Wars devices -- datapad, speeder, carbonite frozen bounty, energy cage, stun cuffs, breathing mask, holocron, datacron, medscanner. Why are the background graphics displayed vertically in some preview areas and horizontally in others, yet vertically in the selection area? Make them horizontal in the selection area so that I know what it will look like when it's turned, as some of the backgrounds are not symmetrical. A million credits is too much to charge, especially with such a dynamic color chooser. If the color looks really bad to some people, or it doesn't come out the way the officers expect, make sure it doesn't cost anything to tweak it. This looks like a system with a lot of promise and flexibility. As a proof of concept, to show us what the heraldry system is capable of, this seems like a great demo. However, for the update launch to be received joyfully by the community, I think a lot more symbols are needed. Iconic starships, droids, helmets, more weapons - anything from existing banners under the civic banner decoration category that's rectangular enough to fit in the symbol space - symbols of all major organizations in the game - symbols of planets - the entire aurabesh alphabet, etc. Then we'll be talking. Of course, more "details" (backgrounds) would also be welcome. For instance, the art style characteristic of the Voss could give us some lovely backgrounds. But I think the artist(s) will find their time most profitably spent on giving the community the highest number of symbols they can reasonably pack into the update. Keep the feedback coming! A quick note, and a question. Note: I know there are more icons that are in development for release. I don't have specifics on what icons, or the quantity, but there are more coming. I will work on getting more details here. Question: Some of you have already raised some great suggestions of icons / banners, so please use this thread as an opportunity for those requests. Be specific. What icons are missing you want to see available for Heraldry? What banner designs? Please lean more on things that are in-game then things that are general to Star Wars (although give those too, but they can be trickier). Be specific. What icons are missing you want to see available for Heraldry? What banner designs? Please lean more on things that are in-game then things that are general to Star Wars (although give those too, but they can be trickier). The best source of inspiration is probably the vast array of decorations that are already in the game. For instance, I'm sure more of the faction banners could be watermarked and converted for use in this system as the "Detail". Speaking for my own guild, I'd love to see some Dread Master themed symbols and again the existing decorations could be used for this. Just off the top of my head... Holocron of Dread, the various dread master statues, Statue of the Oriconian Warrior, Statue of the Ancient Horror. The same could be done with the Gree decorations and so on. Then there are things such as the holo signs like Bith Musician. The Huttball logos from the Frogdogs and Rotworms banners. Gold-plated hutt. Silhouettes of the various iconic creatures and enemies in the game. Location skyline silhouettes maybe or outlines of iconic buildings in the game. The Sith/ Jedi academies, Coruscant, etc. I feel silly asking this, but I can't find any information through searches. Is the heraldry dialog window open only to guild masters? I am a lieutenant in my guild, none of my guild info transferred to the PTS server, the game doesn't even show I am in a guild, so I cant even access the guild window. We may experience some slight turbulence and then... explode. Be specific. What icons are missing you want to see available for Heraldry? Sure thing! Here are some icons already in the game in various ways, which I think would be good to add.